kiev wrote: During the course of dismantling jay's charger i discovered that the 'clear' plastic sleeving and black heat shrink tubing on the inductor and transformer wiring had somewhat melted and fused together. i don't know at what temperature that would occur, but it is likely greater than 360 F. i've never seen heat shrink melt while using a heat gun during application and it is rated at 360F max. i posted some pictures of the internal aluminum heat sink for the soldered board in the troubleshooting thread. i connected to level 2 for charging this morning and measured some temperatures inside the box. Wow thanks for taking the time to get these numbers Kiev I was tempted . . . but thought better of opening mine up and risking warranty refusal, god forbid. The rub is that these components will run even hotter without the charger cases cover removed and they bathe all the components around them in the hot sauna that they are creating. jray3 wrote: While driving, the waste heat loads should be higher, yes, but there is more than just the radiator fan at work. The turbulent air in our motor bay has to provide some cooling as well, compared to the hot stagnant air during a recharge. I'm just glad I never got around to making that rear belly pan for aerodynamic improvement! OK . . . so does this make sense? Looking back at the numbers the lowest coolant temp and case temp numbers were both achieved with aggressive air cooling the charger case only. If the coolant temperature is lower then the components that Kiev has just pictured on the aluminum heatsink (troubleshooting thread) (which are in contact with the coolant loop) would also be running cooler right? Otherwise the coolant temp would stay higher right? I'm thinking perhaps the coolant cooling system was designed to cool only these components on the heat sink. It's the rest of the components on the other boards that are driving the temperature up. From the layout I'm surmising that the liquid cooling was never intended to cool the other components. The case was being relied upon to conduct it out. Which if mounted in a different environment would really do much better. But, Mitsu mounted it in a stagnant (when parked and charging) hot air trap making things much worse. I'm fine tuning my ventilation strategy before finalizing the design. Once the bay hatch was all put back to the normal configuration I'm seeing a modest rise in the temperatures over the original (best) test numbers. I'm assuming that some hot air is getting recycled through the system once it is all closed up. So right now I'm testing different adjustments to mitigate that back to the best case numbers. jray3 wrote: ...I'm just glad I never got around to making that rear belly pan for aerodynamic improvement! Same here, although I never could figure out how to cover the transaxle. kiev, did you leave the cover in place and then remove it to make your measurements, or was the cover off the whole time? Beginning to look like bonding a finned heatsink to the case with the air blowing over it and perhaps some means of extracting that trapped hot air under the rear deck might be indicated ... jray3's initial list isn't looking that far-fetched. A question - What controls the pump cycling?? I just put that big 435 cfm blower under the back of the car, pointed up at the electronics, so I'll check later and see how hot things are getting with it running. It moves a LOT of air! anyway I think im going to "port" the Charger case and then positively pump cooling airflow into and out of it via dual sealed "dust and moisture" proof pipe work from and into the cabin air space. This should assist with those burning hot individual component temps? cheers for the data guys. What's troubling with kiev's measurements is the high temperatures achieved by the magnetics. Even if they used hi-temp insulation, the heat generated and dissipated within the confines of that closed case would be especially damaging to not only the semiconductors but the capacitors as well. Yes Joe that's exactly what i did--left the cover in place except to quickly open and get a reading. i was trying to figure how to drill a couple of holes in the case to mount a fan--maybe a small squirrel cage blower with a dust filter on the inlet. 420 V? The datasheets seem to say 400 V max for 680μF. The GX series are moderate ripple current, long life (5000 hr @ 105°C and rated ripple current). So: about as good as Nichicon make them*, and I've only seen one longer life model, 10,000 hr (one of the United Chemicon series, quite rare). *Edit: Oops, I see that Nichicon do make some 10,000 hr models, e.g. the (L)GR series, but those GR series have lower ripple current ratings. It's possible that they make special order capacitors for these chargers (with a non-standard 420 V rating). JoeS wrote: Beginning to look like bonding a finned heatsink to the case with the air blowing over it and perhaps some means of extracting that trapped hot air under the rear deck might be indicated ... jray3's initial list isn't looking that far-fetched. Yeah, I don't think a heat sink is in order. It might even get in the way with the close quarters when the "hood" is down. The key is lots of fresh air. These blowers I am using are amazing. Thinking computer fan would be way off the mark. These things kick out high velocity, large quantities of air in a small package. The key is to blow so much air over the unit that the entire bay is turbulent and in motion. This allows rapid mixing of the normally stagnant hot air with ambient air being draw up from below by the turbulence. I use a "smoke" test to optimize the turbulence. Put a plexiglass lid on the compartment let the hot air collect, add smoke, Turn on blower and time the interval until the smoke clears. Adjust mounting, rinse and repeat until the results are optimal. There isn't a lot of room to work with, so the solution has to be simple, elegant and effective. No space (or need) for more complicated Rube Goldberg solutions. 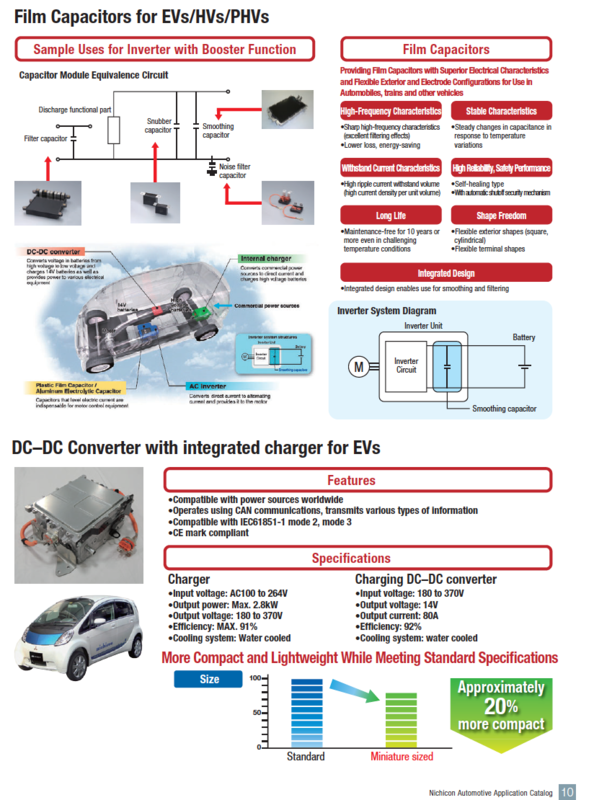 The box has a nichicon part number, and looking thru their website i found they take credit for the miev OBC. In fact they claim that it worked so well for Mitsubishi that Nissan converted over to using their design in the Leaf. So i would say that nichicon is to blame if there are any thermal issues. Wonder if we could buy them direct without getting middle-manned by Mits?